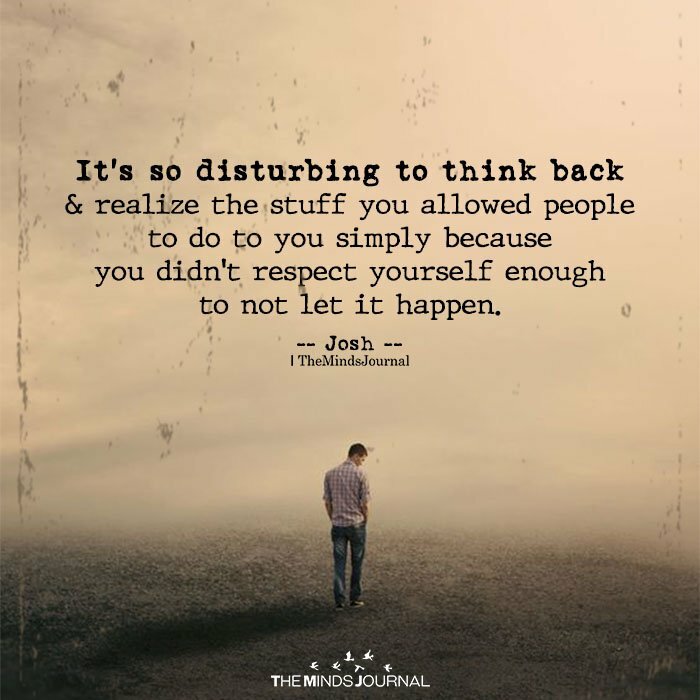 It’s so disturbing to think back & realize the stuff you allowed people to do to you simply because you didn’t respect yourself enough to not let it happen. Its got absolutely ZERO to do with not having self-respect! Covert narcissists don’t exactly announce their intentions to destroy you… They succeed ONLY because, prior to experiencing it for your empathetic self, their cruelty & vindictiveness defied all human comprehension! It’s most definitely not the one’s on the RECEIVING end of other’s bad behaviour that have no self-respect – its those dishing it out. Thinking back is what’s disturbing. Be PRESENT. Live in the NOW. This has nothing to do with non respecting ourself. Compassion and empathy for haters show us who we are.If people play my victim although they abused us or did us wrong have a private conversation if they are playing games or attaining bs from others leave them .Nobody has time for that life is too busy . Learn the power of NO!